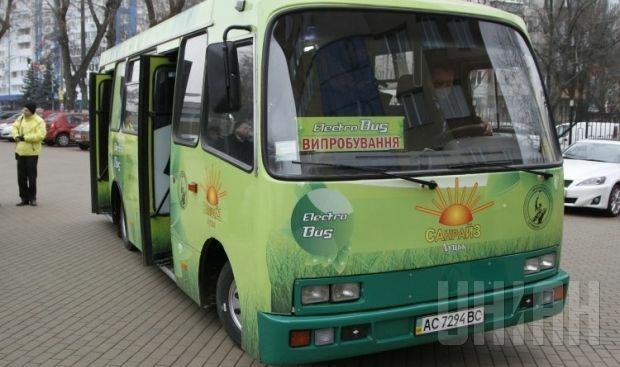 A new Ukrainian-made electric bus that promises to save fuel and cut down on harmful emissions has been presented in Kyiv, the Ukrainian online newspaper Gazeta.ua reported on Tuesday. The new bus is manufactured in the town of Lutsk on the basis of the Ukrainian Bohdan bus. In the new bus, the conventional internal combustion engine has been replaced with an electric one that costs UAH 14,000, and rechargeable electric batteries have been substituted for the fuel tank. “Each new bus helps bus companies save UAH 700 worth of fuel [per day]. Also, these are environmentally friendly buses, with no harmful emissions. The buses can be converted from old Bohdan and Etalon buses, and have a payoff period of two years and three months,” director of the bus manufacturing company Yuriy Devitskiy said. The new buses can cover a distance of 250 kilometers on one charge, and it takes half a day to fully charge the bus at a charging voltage of 220 V, or four hours at a voltage of 480 V. The motor of the bus is extremely quiet, and it has electric batteries instead of rear seats. However, so far, no Ukrainian bus company has placed an order for the new buses. The buses will also have to be certified before they can be put into operation, and the certification procedure can take up to several months.